In reviews of previous versions of InDesign, the looming question was always, “Is this version worth the cost of the upgrade or can I skip it?” But with Adobe’s switch to the Creative Cloud subscription model, this question is meaningless. Every subscriber receives the latest version as soon as it’s available. Based on the quality of updates released since Creative Cloud was launched a little over a year ago, the result of Adobe’s subscription model seems to be good for customers. Bolstered by the confidence that they’ll receive your ongoing upgrade dollars, Adobe is spending less time developing shiny new features intended to entice customers to pay for an upgrade. Instead, they seem to be focusing on improving the real-world usefulness of InDesign. InDesign CC 2014 has giant improvements for ePub book producers and lots of long-overdue improvements to meat-and-potatoes features such as creating tables, hyperlinks, footnotes, scaling effects, packaging of project files and printing to PDF printers. If you or your clients have a new or old book to publish in ePub format, now’s the time—the Fixed Layout ePub format allows any InDesign document to be exported as a digital book, without requiring any adjustment to its layout. The biggest improvements in InDesign CC 2014 involve creating ePub files—digital publications in the open .ePub format accepted by most ebook distributors and beautifully rendered by Apple’s iBooks app on iOS devices and Macs. Almost all current ePub books are reflowable, which allows the reader to change the font size and style, background color, and other characteristics to optimize the viewing experience on any device. This requires careful structuring of the text and images, which is difficult (if not impossible) when the layout is arguably as important as its text and images, such as in a travel guide or children’s book. 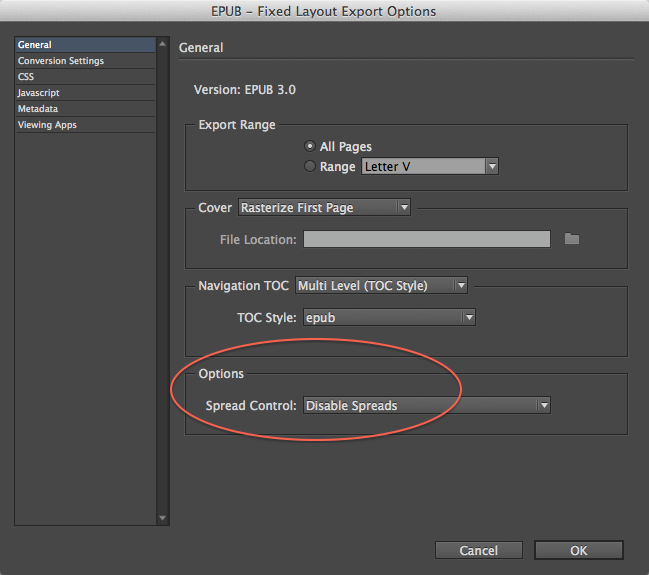 To remedy this situation and allow any book to be published as ePub, InDesign CC 2014 adds the ability to export any document to “Fixed Layout ePub” format. This maintains your document’s layout exactly as it appears on the InDesign page, and doesn’t require the precise structuring of a reflowable ePub. In fact, the user doesn’t need to do anything special to their InDesign document—it can be exported with a couple of clicks, just like exporting to PDF. While Fixed Layout ePubs don’t allow (or lend themselves to) the customization that a reader can apply to a reflowable ePub, the reader can still copy text, look up definitions, and ask the device to speak the text out loud—a reasonable compromise between losing the layout and maintaining readability. The ePub Export dialog box for Fixed Layout ePubs includes a Spread Control popup menu that intelligently separates side-by-side page spreads. According to Adobe, these improvements are possible because their engineers spent the past few years teaching InDesign how to reassemble its pages in HTML format, the underlying format of ePub. 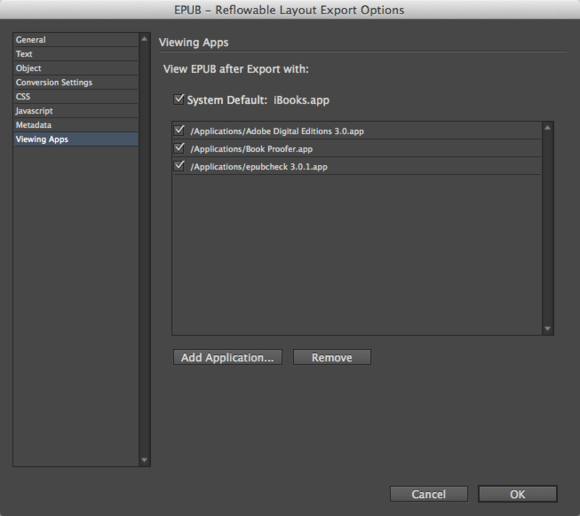 To help ePub producers, Adobe also streamlined the ePub export dialog to be similar to the PDF export dialog, and added additional Metadata fields. And since every ePub producer needs to test their ePubs across various readers, you can now immediately view the exported ePub file in any combination of ePub reader apps installed on your computer. The new ePub Export dialog is simpler and lets you view your exported ePub in any combination of ePub reader apps. 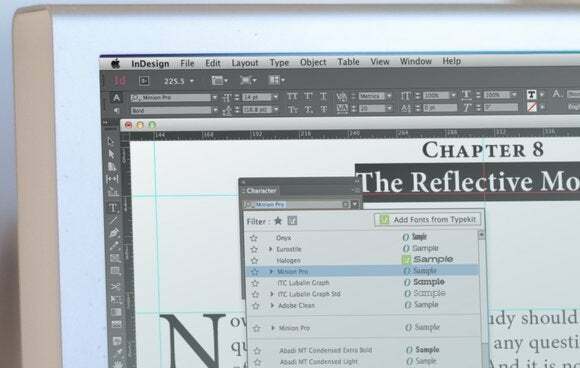 With this release, Adobe has addressed a number of pain points for professional designers. For example, moving a row or column in a table is now as simple as pointing, clicking and dragging it to a new location. Color swatches can now be grouped into folders in the Swatches panel, and when using Adobe Kuler to generate a color set from an image or to grab a pre-made set, those new colors are grouped into a new folder in the Swatches panel. 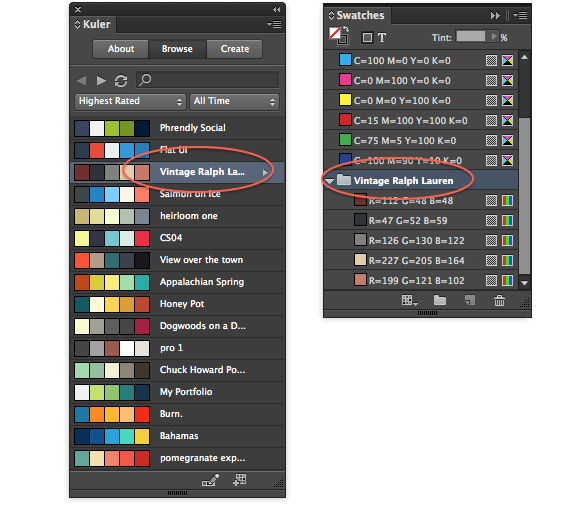 Adding a color set from Kuler now creates a color group in InDesign’s Swatches panel. InDesign files can now be instantly shared on Adobe’s Behance for community feedback, joining Photoshop and Illustrator in this capability. The Search dialogs (text, glyphs, or grep) now include a choice of Direction for the search, which is handy when you accidentally skip a change and need to go backward in your search. Footnotes can now wrap around images, and all Effects now scale appropriately when you scale an object (formerly, drop shadows on text and feathers on gradients didn’t scale). QR Codes can now be generated automatically during a data merge. When importing a text file, you can declare a QR Code to be generated when a specific field goes into a frame. Adobe also added a few technical improvements. While the first release of InDesign CC was optimized for Apple’s Retina displays, the 2014 release adds optimization for Windows HiDPI displays. Also, when printing to a printer that uses Adobe’s PDF Print Engine, InDesign now automatically converts the file to PDF format and sends it to the printer. The Background Tasks window can now be opened by clicking the progress bar in the Control Panel. And continuing Adobe’s move away from Flash, developers now use CEP5 (Common Extensibility Platform) to create new panels in InDesign—Adobe uses it themselves to add panels to Creative Cloud apps. InDesign CC 2014 searches your hard drive for the latest previous version of itself (CC or CS6) and offers to migrate its preferences and settings to the new version. If it doesn’t find a previous version, InDesign will look to the Creative Cloud for settings you’ve synced from another copy of InDesign—a handy feature for Mac/Windows integration or when you buy a new computer. 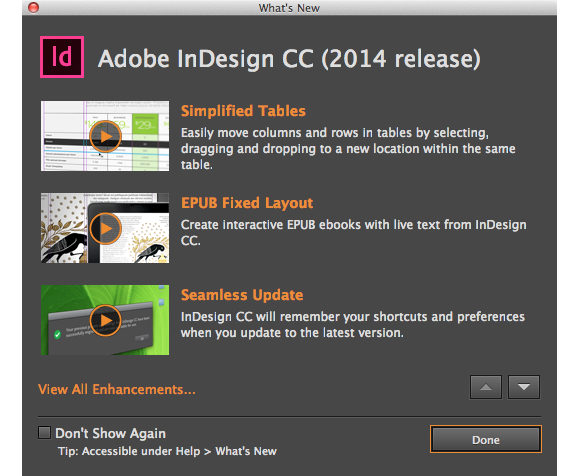 The first thing you’ll notice upon launching InDesign CC 2014 is the What’s New welcome screen. This helpful window highlights several new features, with hyperlinks that display a short video that explains each feature. In January 2014, Adobe added several new features to InDesign CC, when they bumped the version number to 9.2 (The version number of InDesign CC 2014 is now 10.0). These features also carry over into InDesign CC 2014. Typekit fonts can be browsed and added from within InDesign CC, a filter in the Font menu lets you see only Typekit fonts, and missing Typekit fonts in a document can be found and synced (downloaded). Hyperlinks can now be created or edited with a simple right-click on the text, and their appearance can be customized by editing the new Hyperlink character style—but only one Hyperlink style per document. The Hyperlinks panel lets you navigate to hyperlinks, and it warns of errors in hyperlinks by displaying traffic light indicators. ePub creators can now show footnotes that pop up over the page, and Adobe improved the quality of ePub export as well—including Japanese and Arabic language improvements. If you or your clients have a new or old book to publish in ePub format, now’s the time—the Fixed Layout ePub format allows any InDesign document to be exported as a digital book, without requiring any adjustment to its layout. This opens the digital book market to a giant new group of authors, and improvements to often-used features in InDesign will ease the workflow of a large number of design professionals. InDesign's new ePub tools opens the digital book market to a giant new group of authors, and improvements to often-used features in InDesign will ease the workflow of a large number of design professionals.